Back cover blurb: 'Another year and I still don't like old people. Me? I am 83 years old.' Hendrik Groen may be old, but he is far from dead and isn't planning to be buried any time soon. Granted, his daily strolls are getting shorter because his legs are no longer willing and he had to visit his doctor more than he'd like. Technically speaking he is ... elderly. But surely there is more to life at his age than weak tea and potted geraniums? Hendrik sets out to write an exposé: a year in the life of his care home in Amsterdam, revealing all its ups and downs -not least his new endeavour the anarchic Old-But-Not Dead Club. And when Eefje moves in -the woman Hendrik has always longed for -he polishes his shoes (and his teeth), grooms what's left of his hair and attempts to make something of the life he has left, with hilarious, tender and devastating consequences. The indomitable Hendrik Groen -Holland's unlikeliest hero - has become a cultural phenomenon in his native Netherlands and now he and his famously anonymous creator are conquering the globe. A major Dutch bestseller, The Secret Diary of Hendrik Groen will not only delight older readers with its wit and relevance, but will charm and inspire those who have years to go before their own expiry date. The Secret Diary of Hendrik Groen 83 1⁄4 is the Adrian Mole of 2016, the one for the older generation. It is a brilliantly funny account of life in a nursing home and Hendrik's dislike of old people - even though as he admits he is one himself. But what they both lack is a love interest... So... When Eefje appears she brings light and laughter into both Evert and Hendrik's lifes and they are soon both vying for her attention like hormonal naughty teenage boys. I don't want to give too much away as I think that everyone needs a bit of Hendrik in their lives, and like Adrian Mole, I hope there are a few sequels in the pipeline because I can't wait to read what Hendrik and his friends might get up to next! 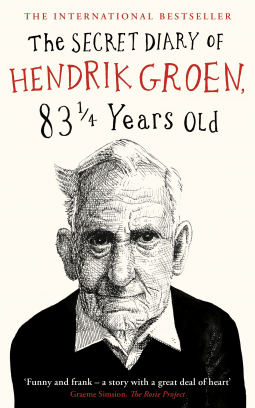 The Secret Diary of Hendrik Groen 83 1⁄4 is available from 25 August 2016. Thank You to the publishers who via netgalley in exchange for an honest review.